﻿ Using Stones for Personal Growth. Amethyst: Enthusiasm. Amethyst is a variety of quartz that forms six-sided transparent crystals ranging in color from deep purple to pale lavender, the color resulting from trace amounts of ferric iron in the crystal. Natural amethyst is primarily found inside geodes in alluvial deposits in Brazil, Uruguay, Africa, Colorado, Oregon, and Veracruz in Mexico. The word "amethyst" stems from the ancient Greek phrase A Methyein, which means "without drunkenness", for in ancient times it was believed that anyone carrying or wearing this stone could not become intoxicated. Today, amethyst is considered an excellent stone for recovering alcoholics. 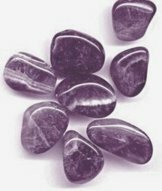 Amethyst acts on the Inner Being to strengthen Enthusiasm. Enthusiasm gives you the power to initiate things, to act with vigor, zeal, intensity and passion in going after the things you want. It helps you acquire a zest for life, and it strengthens the ability to put large amounts of energy into the things you want to accomplish. If you have a high level of enthusiasm, people think of you as perky because you always have energy available to put into those things you really want to do, whether they are primarily for your own benefit or for the benefit of others. Enthusiasm is the part of your personal emotional forcefulness that gives you the ability to face life with optimism, and allows you to enjoy life and the life situations you get into. Enthusiasm has two components to it: One is putting energy into things in an enthusiastic manner. The other is recognizing what is worth getting enthusiastic about, what is worth getting excited about that will produce a positive result. This second component is what helps you control how much enthusiasm and energy to make available for any particular thing. It helps you operate your life more effectively because it aids you in allocating your energy so you can be productive in all areas. If you are an enthusiastic person, not only do you have energy to do the things you want, but you are also good at knowing when to conserve your energy and save it for something else. If you don't have much enthusiasm, you also don't have a great deal of energy available to put into things. You can sometimes feel so fatigued and grouchy that you wonder if there is anything that is worth getting enthusiastic about. This feeling can frustrate you and at times make you angry, which further diminishes your overall ability to accomplish things. Because you don't want to put out any more energy than you have to, you tend to withdraw from people and this makes you feel alone, isolated and gloomy. In addition, since you are not good at judging how to use your energy, you often waste it by putting it into one project while neglecting other things in your life. If you have trouble being enthusiastic, or if you always seem to be getting most excited and enthusiastic about things that end up turning into slush, consider making a couple of changes: Practice using your energy more efficiently. Become skilled at estimating how much energy to put into something in order to use your energy effectively. Base your energy input on what results you think you can get from putting in that energy. This will help you use your energy wisely and keep you from wasting it by putting it into useless things. If you know when you are using your energy efficiently, you have a much better idea of what you can accomplish before you start. And if you have a good idea where you are actually going with a project, enthusiasm for it flows naturally. If you would like to become more enthusiastic, it is also helpful to get as far away as possible from the very negative idea that "Life is rotten, and then you die". Instead, take the more optimistic viewpoint that life is basically good, that people are not out to get you, and try to let go of being a guarded cynic. Also, work on letting go of preconceived ideas. Practice being open to discovering new truths by developing a strong interest in finding answers to life's questions. Not only will this help you find knowledge that will expand your horizons as a person, but it will increase your general level of enthusiasm for living, and enable you to move more easily into new areas and approaches to life. Another way to become more enthusiastic is to develop your awareness of what you really need, that is, become more aware of what is good for you, both physically and emotionally. If you really know what is good for you, or for others, you will have an enthusiasm for providing what is needed. By becoming a more enthusiastic person, not only will you increase the amount of energy you have to put into things, but you will also become more aware of what things are worth getting enthusiastic about. 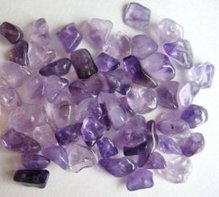 To help increase the level of enthusiasm in your life, carry a piece of amethyst in your pocket or purse.